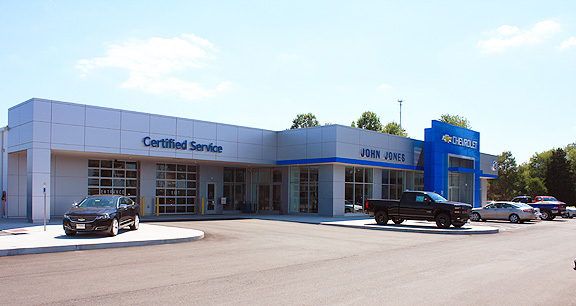 Project obstacles and solutions: John Jones Auto Group expanded into a new location; John Jones GM City in Scottsburg, Indiana in February 2015. Koetter Construction was the general contractor for the project. It included a 28,000 square foot showroom and service center. The dealership is surrounded with concrete curbs and walkways that are customized with ramps and roll curbs to accommodate new vehicle displays. The approach and exit to the service and car wash areas are slow inclined concrete that abuts the service bay doors. The interior flooring in the service areas was built with polished colored concrete. This was then sealed with a high gloss sealer for easy cleanup of any spills on the floor. The floor makes a good impression on customers as they drive into the service area and is very easy to maintain and keep looking clean. For more information on polished finished floors, contact your local IMI sales representative. Click here.